Easy digestion: Gentle on sensitive tummies, with probiotics to support the digestive system. Omega 3 & 6: ROR contains balanced levels of omega 3 and omega 6 fatty acids to maintain a healthy skin and coat. Immunity boost: Optimum levels of vitamins, minerals and antioxidants to help keep their immune system strong. 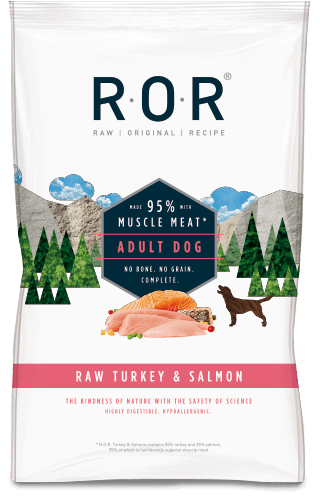 R·O·R Turkey & Salmon is made with the highest standard, prime cuts of nutritional bone-free meat and does not contain any indigestible bone. Using bone-free meat means that R·O·R contains the perfect balance for essential amino acids, energy requirements and nutritional qualities needed for adult dogs, as well as being easily digestible for sensitive tummies. With the Kindness of Nature and Safety of Science R·O·R has been perfectly designed and balanced for optimum health and nutrition using only the very best quality ingredients. Store at -18°C or below. For best before date, batch number and approval number, see bottom of bag. Free Range Deboned Turkey 55%, Deboned Salmon 30%, Sweet Potato 5%, Carrots 5%, Redcurrants, Salmon Oil, Seaweed, Yucca, Green Tea, Dandelion, Hawthorn Leaf, Beet. Calcium 0.35%, Phosphorus 0.23%, Crude protein 11.10%, Crude Fibre 0.50%, Moisture 62%, Ash 2.10%, Total Oil 19.34%. R·O·R 2019 - All rights reserved.